Who Farms in Japanese Farm Households? What Dairy Products Do Japanese Eat? You can enter this virtual reality ricefield. Click on the Audio-Video link below. It is about a 400kb download. QTVR Courtesy of Masanao Takeyama. 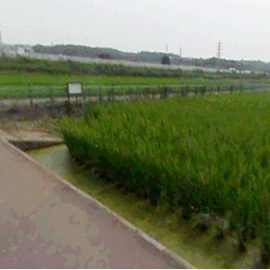 Japanese rice is grown in special fields called paddies. They have layers of different kinds of soil and are surrounded by a raised dike or embankment about two or three feet high, so the field can be flooded with water for the first part of the growing season. Traditionally, paddy fields were quite small. They often had an irregular shape to follow the contours of the land. Every paddy field has simple devices that open to let water flow in or out of the paddy, and close to hold the water in place. All the paddy fields in an area are connected to neighboring paddies. A network of ditches links them to a stream or canal that brings water to the paddies. The farmers in one village, and sometimes in several neighboring villages, have to coordinate their rice planting with a schedule that determines when the water will flow into each paddy field to flood it. Click on MAPS, below, to see a diagram of the irrigation of paddy fields in the village of Niiike, Okayama, in the early 1950s.